There’s virtually nothing stopping someone from committing another mass shooting on the scale of Vegas or Orlando, writes Kevin Hertzog. When the Pulse massacre happened in Orlando, LGBT people in New York City spontaneously met up in front of the Stonewall Inn the very next evening. We also headed there on the day when it was announced that we’d won marriage equality. It’s where we gather as a tribe or as a family, because it’s the place that we feel the most comfortable being with one another without the constant monitoring of our behavior that’s required almost everywhere else. We can hold hands and kiss and hug and cry and grieve without the added layer of having to worry about getting harassed or assaulted. We feel safe there. Another place gay people feel safe is in a gay club. That’s one reason why the massacre at Pulse felt like a particularly devastating attack. The shooter hunted us down on our own home turf. For us, that time it felt personal. On Sunday in Las Vegas, someone with a stockpile of guns and ammunition set out to inflict the maximum amount of damage on the greatest number of people. His motive is much less important than is the fact that there were very few roadblocks in his way. The gun laws in Nevada are among the most lax in our country. We should not be surprised that this happens so often. We should be surprised that it doesn’t happen more often. There’s virtually nothing stopping anyone from doing the exact same thing. That’s the terrifying reality. Gun violence has reached an epidemic level in this country. It has taken away our capacity to feel safe anywhere. It’s a full-blown public health crisis. Unfortunately, gay people have some history when it comes to dealing with public health crises. When AIDS tore through our community, we learned how to turn our grief into anger and our anger into action. ACT UP taught us that no matter how high the odds are stacked against us, we can still effect change if we present a united front and are relentless in our attacks. We formed Gays Against Guns in the immediate aftermath of Pulse, and we used ACT UP as our inspiration. In fact, many core members of GAG were once members of ACT UP and Queer Nation. We’re proud to continue the tradition of engaging in direct action and raising our voices against the system that’s in place. Gay people are uniquely qualified to attack government inaction, apathy, and complicity because we’ve seen it before and we know the price of silence. We also know the road map to success. The National Rifle Association pours money into Washington so that the gun manufacturers it serves will experience profit growth in the same way that pharmaceutical companies inflate the pricing of HIV medications without any regard for the health and welfare of the people taking them. In both cases the climbing body count gets ignored in favor of a climbing bottom line. That’s unacceptable to us, and it should be unacceptable to you too. Massacres like the one that just happened get the most media attention, but they are not, in fact, the way that most victims of gun violence die. Suicide is responsible for almost two-thirds of gun deaths. We know that LGBTQAI people are disproportionately more inclined to attempt suicide than our counterparts. We also know that overall suicide rates are lower in states with more restrictive gun regulations. So easy access to a gun is quite literally lethal, and more so for us, because we’re more susceptible to attempting to end our own lives. And no discussion of violence toward our community is complete without acknowledging the fact that of the murdered trans people in the United States, over 80 percent are women of color. As a nation we are, once again, being shown that the racial divide is far from being bridged. We must do a better job of ensuring that those of us who are more vulnerable can enjoy the same freedom from discrimination in such areas as housing and employment as the rest of us do. We should not stop fighting until we can all feel safe. 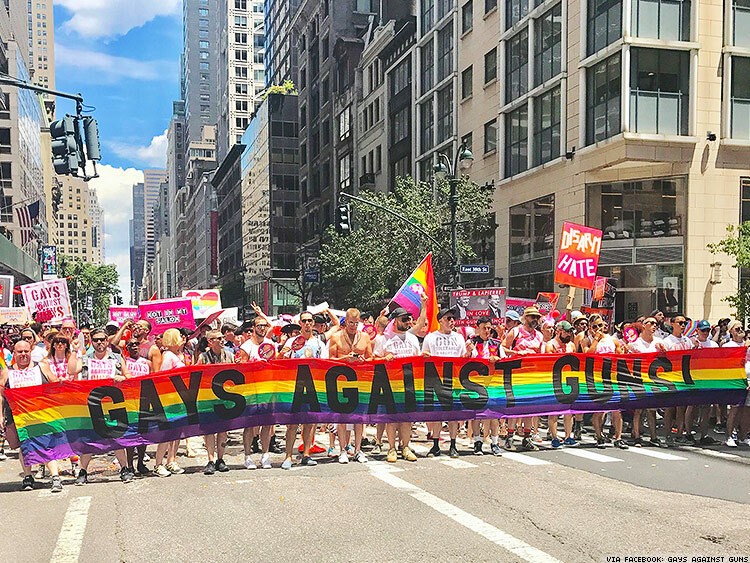 Members of Gays Against Guns have carried this message to many different places and by many different methods. From the very beginning, we intended to incorporate our queer perspective into every action we take and every statement we make. We recognize that our “outsider status” gives us a power that other gun violence prevention groups may not have access to. We’re not afraid to make noise and we’re not afraid to be impolite. We unapologetically make demands because we’re getting slaughtered in our nightclubs and our churches and our schools and our playgrounds and we’ve had enough of it. We’ve had enough dying. We’ve had enough sorrow. We’ve had enough people writing us off as silly or frivolous. We’re here, we’re queer, and we’d prefer that people would stop shooting us. It’s not too much to ask. We urge you to “come out” as a gun violence prevention advocate. We’ve been bullied into polite silence by the NRA and its trolls for far too long. Many people feel intimidated to argue with those who vehemently advocate for the Second Amendment. Do not be one of them. Be someone who is unafraid of being on the right side of history when it comes to the topic of gun control. Be someone who knows all the facts and statistics and isn’t shy about saying them out loud. Be a force for positive change in this world. Because when it comes to the topic of guns, the stakes are literally life or death. KEVIN HERTZOG is the cofounder of Gays Against Guns.